Our sponsors/donors have generously given their time, space, or money to make the market a great experience. Whether it be financial support, manning some aspect of the market, or volunteering their expertise/skills, we'd like to extend very big THANK YOU to those local businesses and individuals who have helped us make the Oshkosh Saturday Farmers Market what it is today! Interested in being a sponsor? Download information below. 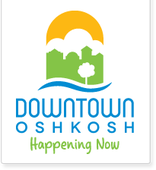 The Oshkosh Convention & Visitors Bureau (OCVB) is a private, not-for-profit organization, funded solely through room tax dollars from Oshkosh hotels. Its mission is to promote Oshkosh, Wisconsin’s Event City and Winnebago County as a premier destination for corporate, sports and leisure groups and individual visitors. The BID was created in 1987 to assist downtown business owners coordinate their efforts in the areas of marketing, promotion, property management, revitalization, and retention programs. The BID assists with new business development initiatives, and provides a mechanism to allow property and business owners to have a role in directing the activities within the district that influence their investment and business environment. Simply put, we make it our business to hit your mark - every time and on time and that's a statement we make in ink on every single piece of printed material that leaves our building. In the more than 180 years since, we have remained steadfast in our approach. While today we offer the convenience of 188 banking centers across Indiana, Michigan, Kentucky and Wisconsin, we are still the same service- and community-focused institution that began in a modest one-room building on the shore of the Ohio River. 4imprint provides promotional products to businesses and organizations of all sizes in the US, UK, Canada and Ireland. But what makes us really special are our people - we're a friendly, genuine and helpful lot. Give us a try by visiting one of our sites or calling today! Not sure about an item, ask to get a free sample, we'd be happy to help! Promotional items really work! As an independent insurance agency, we are able to quote many different carriers to find the right product at the right price for you or your business. Providing value to our customers with experience, expertise and customer service has allowed us to become one of the largest full service agencies in Wisconsin with over 50 employees and six regional offices; Beaver Dam, Columbus, Oshkosh, Watertown, West Bend and Richards Benefits in Beaver Dam. The 920 Tattoo Co is the creation of Steven Anderson and Carrie Olson. Their tattoo studio, located in the heart of historic downtown Oshkosh, WI, offers high quality tattoos and piercings on a walk-in, or appointment basis. Their goal is to bring high quality, timeless, and inspired art to each client, every time. Realizing that today’s tattoo client wants their tattoo to be as distinct as they are, Steven and Carrie strive to take the mystery out of the tattoo design process, and work closely with our clients to create art that will stand the test of time. Whether it’s something you imagined, saw printed in a magazine, or posted on the internet, the artists at the 920 can work with any reference to make your tattoo fantasy into a reality! You dream it, we draw it. Its that simple. Crescent Moon Antiques and Salvage located at 537 N. Main Street, Oshkosh, Wisconsin,the heart of the Midwest, specializes in architectural antique salvage or reclaimed material provided for reuse in building restoration , new home construction and decorative arts.